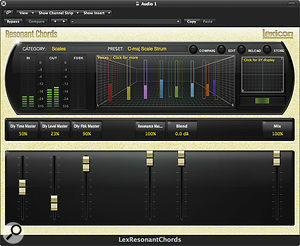 Lexicon are synonymous with high‑end reverb, but also make versatile multi‑effects units. Now they've spun off the delays, pitch‑shift algorithms and special effects from their PCM boxes into a new plug‑in bundle. Lexicon are, of course, best known for their high‑end reverb processors and, more lately, reverb software plug‑ins, but since the launch of their PCM70 hardware processor back in the mid‑'80s, the company have also produced some pretty off‑the‑wall effects programs. This tradition continues with the PCM96 hardware, which offers both cutting‑edge reverb and special effects, some quite weird. All of the latter are now available in the Lexicon PCM Native Effects plug‑in bundle. Like the Native Reverb bundle that came last year, this new addition is PC and Mac compatible, and works in VST, Audio Unit and RTAS‑compatible host DAWs. An iLok 2 is required for authorisation. The Native Effects bundle appears in your plug‑in list as seven individual plug‑ins, all sharing a fairly common style of interface based on that used for the PCM96 control software. A visualisation window can be clicked to give a graphical representation of the current effect and its parameters, while adjustments are made using mainly the faders in the lower half of the plug‑in window. It's possible to sync relevant parameters to song tempo. Each effect type also comes with a useful library of presets to show off its capabilities. Dual Delay covers all the usual delay‑type effects, from slap‑back echo to tape-echo emulation and pristine digital delay. As with the other plug‑ins, an intuitive, and thankfully not over‑complicated, control panel gives access to the necessary parameters, such as delay time, wet/dry mix, feedback, and so on. As the name suggests, each input channel has two separate delay lines, with an adjustable delay time of up to 9.5 seconds. Each has its own feedback controls and filter/EQ plus polarity, level and pan controls. 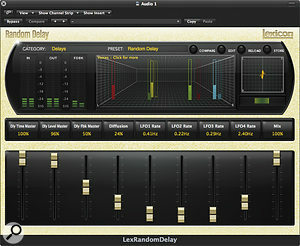 Random Delay, again, has two taps per input, plus high‑pass and low‑pass filters, which go some way towards emulating lo‑fi or tape delays. Here, the delay times can be modulated by signal level or using an LFO, or they can be made to jump in random steps through the Wander modulation parameter, which adds up to one second of additional delay time for each voice. The delay lines can be set individually to random or non‑random, and each voice has its own LFO, output and feedback control as well as output filtering, polarity, level and pan controls. As you might expect, the effect here can go from a subtly warmed delay to a very jittery, random delay effect. Chorus/Flange incorporates a long multi‑voice delay, allowing the flanged or chorused sounds to follow behind the dry sound when appropriate. The same LFO modulators are available as for the Random Delay algorithm, but whereas the voices in the Random Delay algorithm move in steps, the Chorus/Flange voices change gradually, giving a very smooth, lush sound. The algorithm has four delay voices or taps per input, with the delay time again variable up to 9.5 seconds, so the overall result is far more dense and complex than you'd get from a standard chorus. 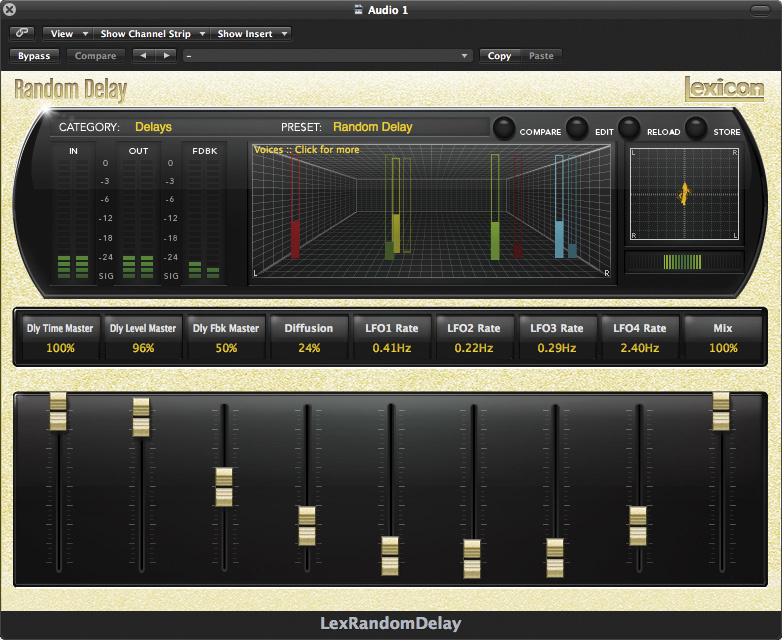 Juggling with the delay and feedback values allows phaser and flanger‑type effects to be created. Each of the delay taps includes a separate filter/EQ section with polarity, level and pan controls. Resonant Chords was a Lexicon first, and though other companies have tried to do something similar since, the Lexicon approach still sounds by far the best to my ears. I first heard this effect on the PCM70, where very short delays with feedback could be individually tuned to resonate at specific musical frequencies. Now the effect is available as a plug‑in, comprising six resonators plus additional delays. By tuning these resonators to the notes of a chord, a percussive sound such as a drum can be made to ring, producing a sound not unlike a plucked harp. Furthermore, by delaying each resonator (there are four delays per input), it is possible to set up an arpeggiator‑like effect where the original impulse is followed by a sequence of tuned resonances. There's plenty of scope for creative weirdness here. Non‑percussive sounds produce a less obvious effect, but some wonderful and unexpected results can still be achieved when processing guitar or synth sounds. It would, however, have been more useful if the resonant chords could be controlled from a MIDI track or from an imported MIDI file. 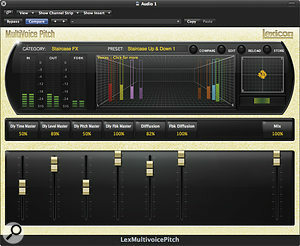 Pitch Shift delivers a number of mono and stereo pitch‑shifting capabilities, from mild detuning and (manual) pitch correction to the surreal, though its real focus is on producing traditional pitch‑change effects to a high technical standard. For example, it can be used to massage programme length when converting video between different frame rates, or for pitch‑fixing individual notes in a recording. It can also be used for creating cartoon voices or deep 'villain' voices. There are two operational modes, labelled Musical and Percent. In Musical mode, pitch can be adjusted in semitones and cents over a one‑octave range, whereas in Percent mode the shift values are displayed as percentages. This algorithm also provides control over crossfade times to minimise processing artifacts, low shift cutoff frequency and 'smart shift', plus a correlation parameter, which allows you to link processing between channels on a stereo signal. 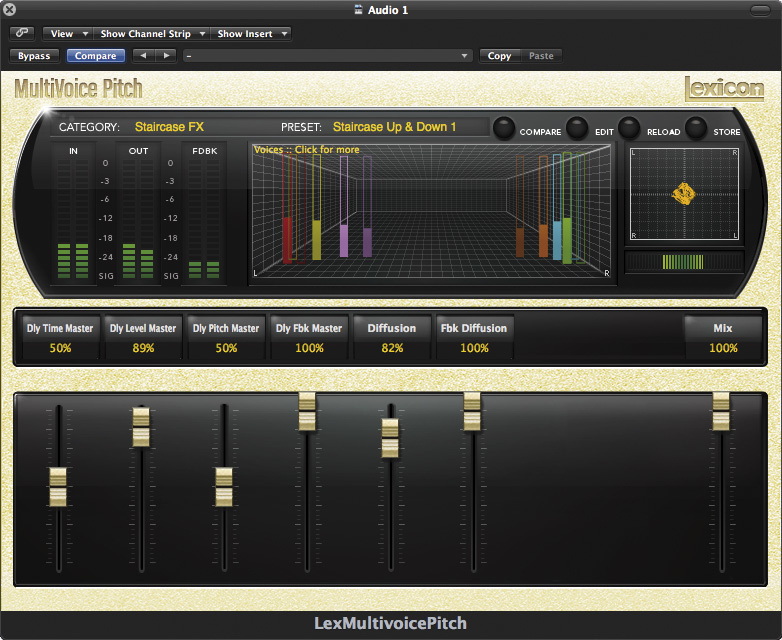 Multivoice Pitch Shift is basically a multi‑tap delay (six taps, three per input) with a pitch‑shifter on each voice and where each can be set to a different pitch shift. It goes from subtle detuning to 'seasick whale in a tumble drier', as each delay line can be set to shift up and/or down, while the delay times are locked to the current song tempo. Check out the 'Seasick Room' preset — it does just what it says on the tin! Pitch can be adjusted by up to an octave either way, in semitone steps, with fine detuning available up to half a semitone either way. Each voice can have a delay time of up to 4.75 seconds, with independent output level and feedback control, so spiralling pitch ascents and descents are a doddle to set up, for those 'it was all a dream' sequences. Again, the outputs have a filter/EQ section with adjustable filter frequency, filter bandwidth and filter shelf, as well as the usual polarity, level and pan‑position control. 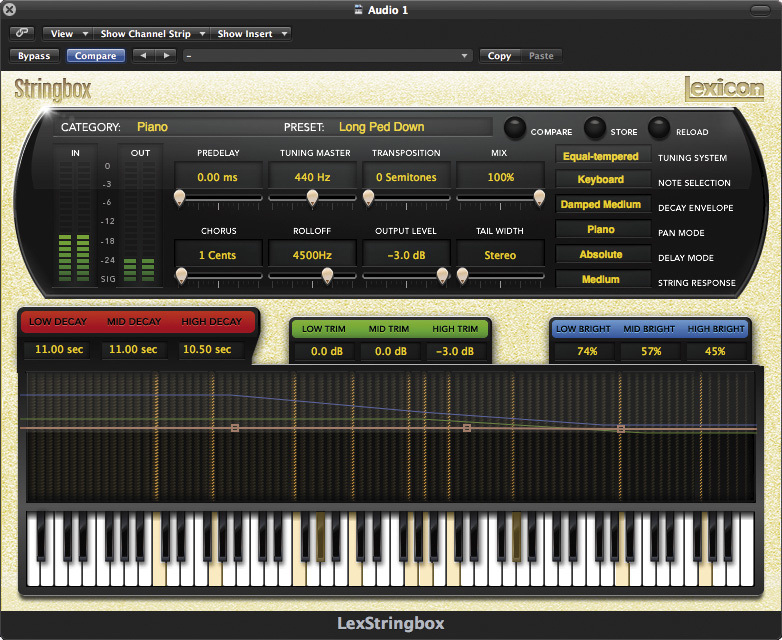 The Stringbox algorithm is new to me and seems to be Lexicon's take on the 'piano reverb' idea, with 88 virtual strings that resonate as they are excited by the audio input. It's a bit like playing an amp into the workings of a piano with the dampers off. A number of tuning and panning adjustments let you make the results unsubtle, very unsubtle or psychedelically ethereal. A virtual keyboard allows the user to home in on that part of the keyboard where the most resonance is required by adjusting points on a graphic 'level' line, while a randomiser allows the user to simultaneously both discover and lose the lost chord! The strings can be tuned in several different ways or detuned relative to one another, and the resonant characteristics of the strings' material may also be adjusted. With the visual window activated, you can also click on the keyboard to set up your own chords or modes, which is great for turning just about anything into a New Age track. Don't let Martin Walker see this! Unless you do select the notes you want to resonate, the lingering string resonances often sound quite dissonant, but when mixed in at a lower level, the result can still be surprisingly usable. All the effects here work to a very high standard, but they are special effects, which means that other than the delay and chorus, you may not need to use them very often. 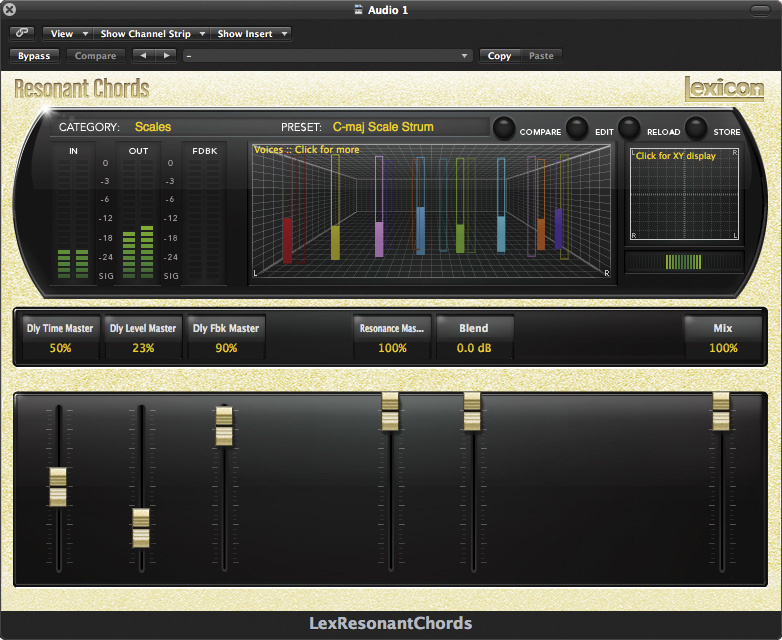 I love the Resonant Chords program, which could be put to work anywhere from dance music to New Age, while the chorus is really very good for adding weight and texture. 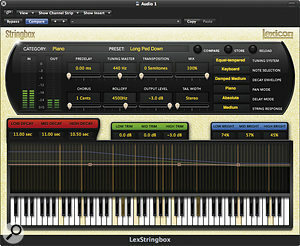 Stringbox, on the other hand, has few obvious applications and is probably best kept for special occasions, or at least mixed in sparingly. Using the pitch algorithms, it is possible to create some really high‑quality detuning or detuned delay effects for vocal or instrument thickening, though the more extreme settings are again probably best reserved for spot effects. If you need these types of effects delivered to a very high standard, this plug‑in bundle is well worth the asking price, no question, but they're not all 'everyday' effects like Lexicon's reverbs, so it may be harder for smaller studio operators to justify the expense. In all, though, it's a very impressive collection of effects delivered to a very high level of quality. There are numerous pitch and delay plug‑ins on the market, as well as a few 'piano reverb' type things such as PSP's freeware Pianoverb, but I've never come across a resonant chords program that approaches the Lexicon for quality. Replicates the PCM96's special effects section. No MIDI control of resonators or pitch‑shift effects. Some will view it as expensive for effects you might not want to use all day, every day! Providing all the PCM96's special effects programs in a native format, the PCM Native Effects bundle is a welcome addition to the Lexicon range.